I live in Denmark, often spend my holidays in Croatia, and I always bring my boat along. This country is NOT in war, although many still believe it is. I like this country very much. 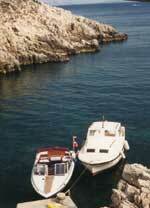 Croatia has a beautiful nature, is not too expensive, and of course, it has a mild climate. 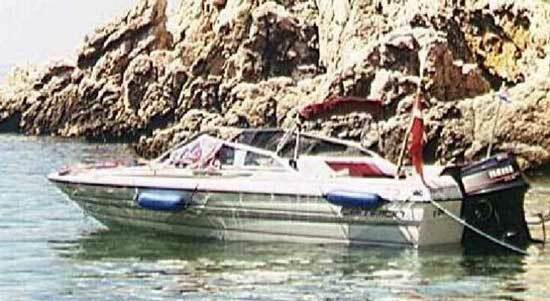 In the springtime of 1990 one of my big dreams became real - I got the boat named Kon-Tiki. I like to take my boat everywhere I go for a vacation, and from the very beginning I decided that it must be possible to take the boat to the country then still named Yugoslavia. It meant that the boat must have been light enough so that I can trail it with my car. My choice was a 17-foot speed boat from Canada with seats for 6 people. It's possible to sleep in the boat, but for 2 persons only. The boat is equipped with a 60 HP engine which gives it a maximum speed of 35 knots. Such a speed is only pleasant on smooth seas. 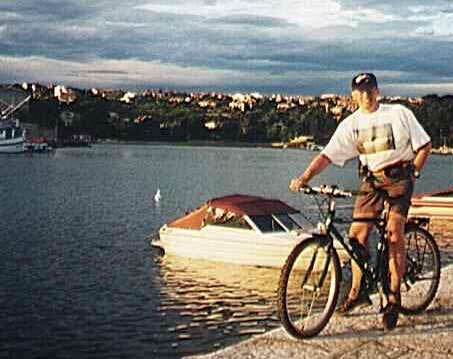 This photo is from the harbour in the city of Krk. It shows me going down to the harbour to check the mooring. I took a bicycle along for the first time this year and I found out it was one of the best ideas I have had for this trip. To have a boat is not very different from having a caravan. The big difference is at the moment you got to your destination. The caravan gives you a high comfort in the night, the boat gives you freedom in the daytime - freedom to go out to any beach far away from the city. This photo-series takes you to some of these places. 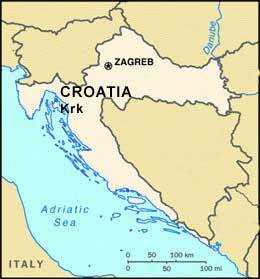 The island of Krk is the biggest of the islands in Kvarner-bay, and the main city on it bears the identical name: Krk. 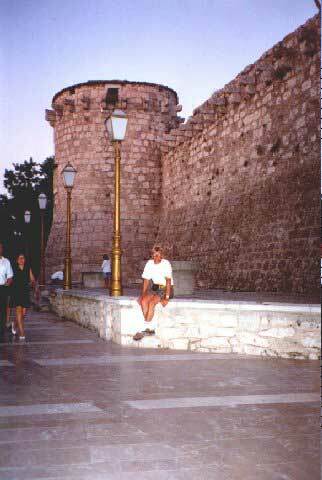 It's an old city with beautiful old fortifications built in the 15th century. 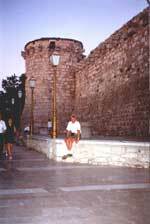 The photo is of this fortification, and you can see it if you walk from the harbour and up into the city. 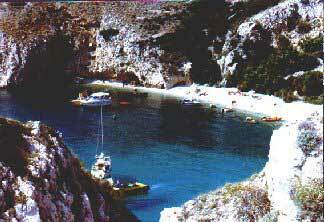 When you leave the Krk harbour and sail east, you will come to a big, almost completely enclosed bay. Here is the town of Punat along with its' famous small-craft shipyards. Here's a nice shallow beach. On days when the winds are too strong, this bay is an ideal shelter for boats. 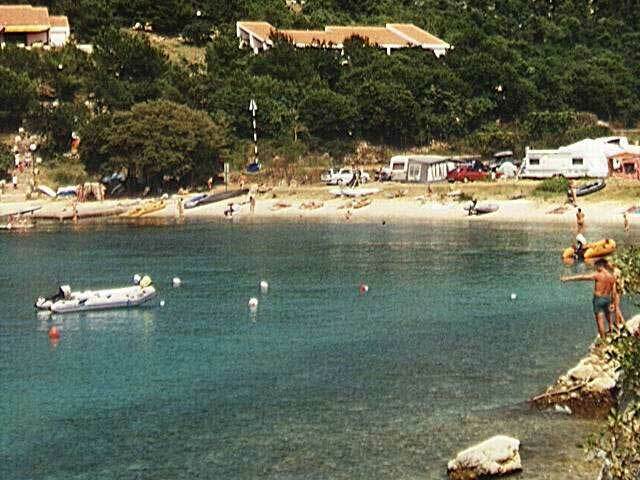 In this bay you can find a naturist camping ground named Politin. To the south there is another naturist camping ground. It stretches over a big area, and if you want to go to the city from there, it's quite near. Next stop is when you turn around the corner. On the left you can see an old lighthouse. Stay away from the coast! Only if you approach with a very small boat, you can visit this lighthouse. 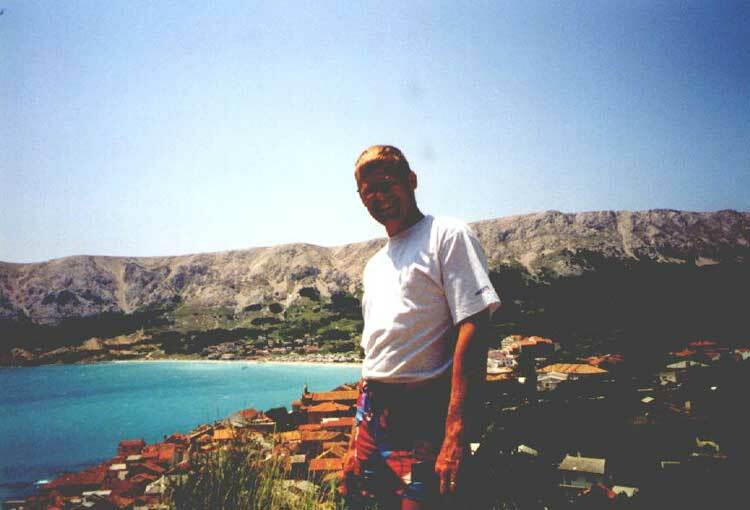 From here you have a good view to the Bay of Punat and the city of Krk in the background. From here and down to Stara Baska (Old Baska) you find bay after bay. Only a few of them can be reached from land, all others only by boat. 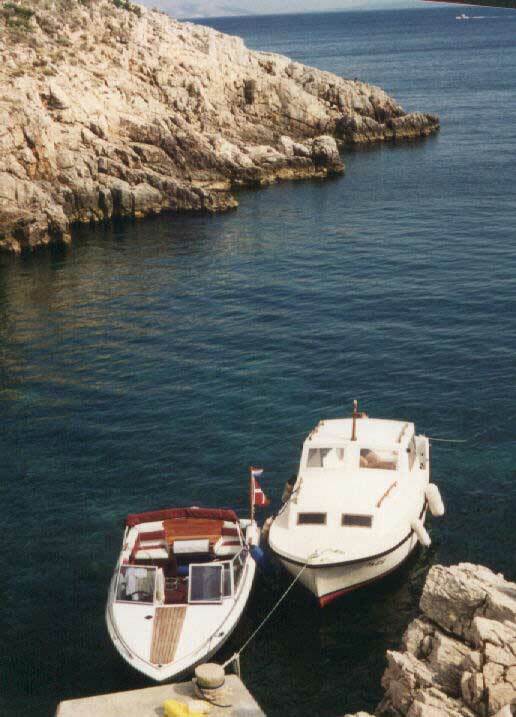 At these bays you meet people from all over Europe in big and small boats. There are not so many sailing boats, but it is because there is not much wind here. If you don't have a boat, you can board one of many sightseeing boats. They can be found alongside the quay on the eastern end of the city - near the hotel. You can also hire a small boat of wood with a small Tomos outboard motor. It's not very fast, but it's cheap. If you go 5-10 km towards the south, you'll find a big naturist camping ground called "Konobe". It's quite large, and it has all the facilities you'll need. People from all over Europe come here year after year and I have met many that have been coming here for more than 10-15 years. More to the south you can find one bay after another. Here you can see many boats in the daytime. Most of Krk's coastline is one big naturist beach, but it's your choice, and nobody will frown upon you if you keep your swimwear on. Any other way, in my opinion, would be crazy. Before you enter the sea remember to put on your swimming-shoes, because almost everywhere on Krk's coastline there's plenty of sea urchins. On the other hand, as a reward, you can see some 15-20 meters deep into the water, so you can watch your step. Going down to the southern part of Krk, you come to city Baska. On your way you also see some small towns, all with a great view to the sea. Take a break in these small towns and enjoy the atmosphere. There are many small restaurants, particularly at the seafront in Baska. The southern wind can be very strong, and then the waves can be huge in the big bay (see photo). Here are a couple of camping grounds, too. On the eastern side a big one, and a naturist one to the west of the city. 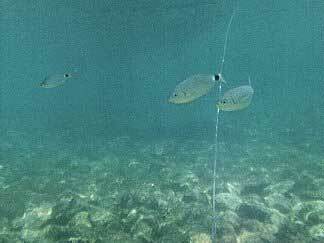 The sea around the Krk island is very clear, and rich with fish. Often only 10 meters away from the coast the sea is some 20 meters deep. 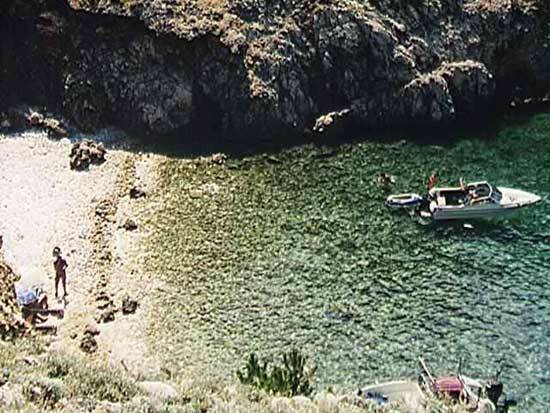 Inside most bays along the coast the sea is rather shallow, so these bays and coves are good and safe for children. Forget your fishing tackle at home! There's plenty of fish, but it seems they don't care about hanging themselves on the hook. Incidentally, it's very difficult to catch a fish because the sea is so clear and fish can actually see your hook and line, and they are not as stupid as you would think. This is a photo of one of many coves threaded along Krk's coastline. It's half an hour away from Krk City by boat. If you get there before 11 o'clock in the morning, you can still find a place for your boat, but later than that there may be some 20-30 boats already, and then it's impossible to cast anchor there. Many boats are from Germany and they are usually very helpful at sea. Here I am in one of the many quiet coves where I relax for a whole day and which can be reached only by boat. No boat = no cove. In this cosy cove you can do what you like. You can swim, sunbathe or sail out to the blue sea. The sea is absolutely fantastic for swimming, and the visibility in the sea is some 15-20 meters deep, with a water temperature of 15-20 degrees (centigrade). The climate is very mild, not too cold or too hot. You are guaranteed to have a lot of sunshine. One day you can have the cove entirely for yourself, another day there will be other boats. The coastline is rocky and steep, and from the top of the cliffs there's a great view to the sea with many small islands. Last photo is of an old lighthouse. Now it's empty and no one lives there. Most of the beaches on this island are naturist beaches, so after launching my boat, I feel the holiday starts. Thanks Olaf la Cour for this report. Olaf la Cour's home page.